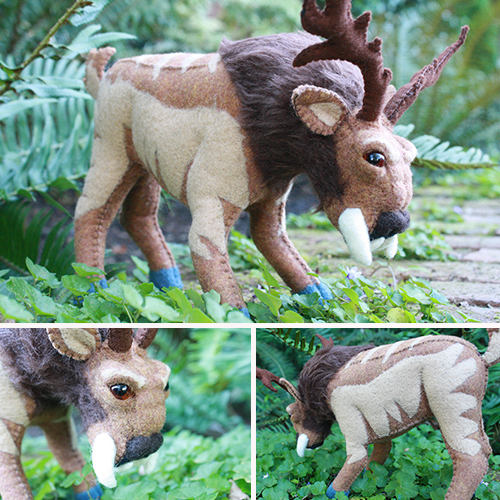 I’ve come a fair ways from simple (but adorable) baby Myr, and thank goodness, because if I’d been asked even a year ago if I could make a Garruk’s Companion plush, I probably would have laughed despairingly, wishing to be capable of such a thing, yet knowing it was not so. But practice, boys and girls, makes perfect. 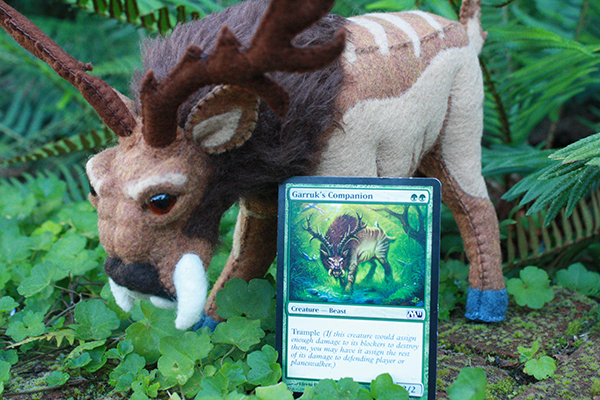 Or at least it makes a Garruk’s Companion plushie. Even when I started this project, I wasn’t entirely sure how I was going to make it all happen. That’s part of the adventure – the terrifying, nerve-wracking “Oh my gosh I’m going to fail” part. I frequently decide to make something, but am not entirely sure how it’s actually going to get made until I start doing it. This is probably not a sound life strategy, but so far it’s working well for crafting. 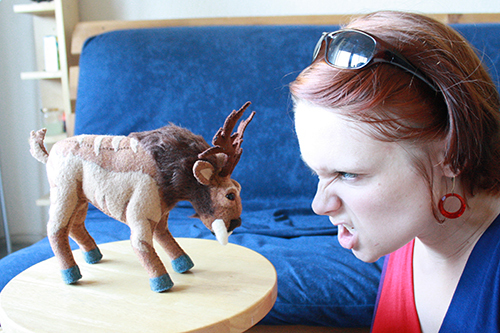 This fellow is, I suppose, more of a “soft sculpture” than a “plushie,” for any who care to draw that distinction. To me, they’re all moderately soft and fuzzy in the end, so whatever. This guy may well bite you if you try to pet him, but he would feel soft if you could actually get at him without losing appendages. but it can be achieved with time. And stuffing. 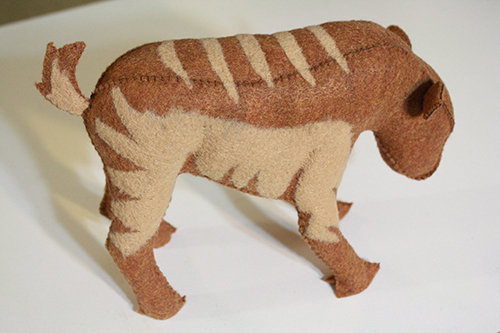 The secondary colouring, which created the stripes, was entirely needle felted on to make it look like a seamless and natural colour pattern (see below). That… well that took a while. But I really can’t imagine having done it any other way. Glue would have been a horrible cheat (plus it wouldn’t work the edges of the lighter felt pieces in nicely, so they’d just look like they were sitting on top of the body, rather than being part of it, which would look lame), and sewing it on by machine or hand would have similarly not created that illusion of it all being one connected thing, since you’d see the lines of stitching all around the lighter felt pieces. 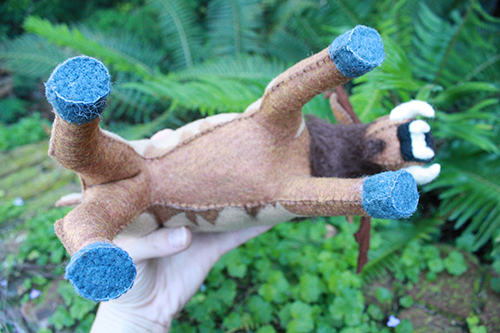 So the needle felting took time, but was well worth it. 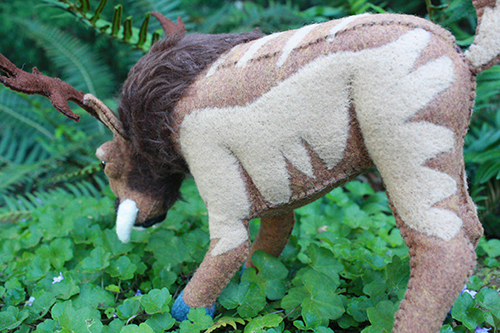 Then the ears were added and the mane was sewn on – my first-ever use of faux fur. 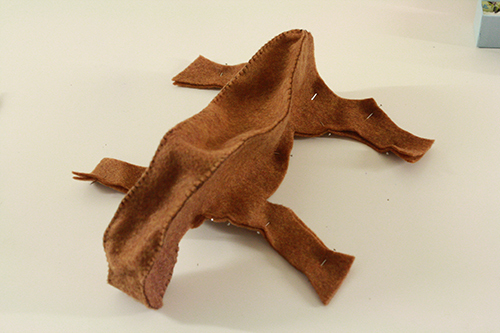 That was a fun little adventure in having bits of brown fuzz all over my desk, since (I learned) you really can’t cut fur into any shape at all without creating a bit of a mess. 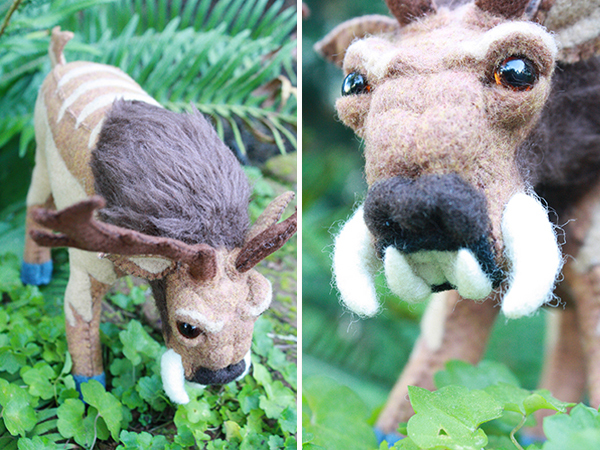 And after that, the facial details were added with needle felting. 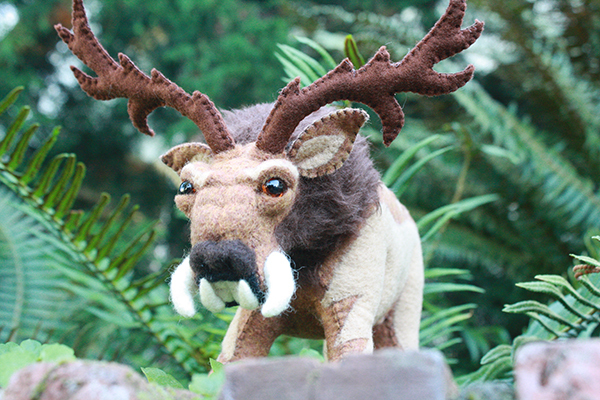 The tusks and large lower teeth were felted as separate pieces and sewn into place, and all other details were felted directly onto the head, giving it shape and personality. The eyes are glass. Below you can see some of the progression of the face as it grew more and more detailed. And the mane got cleaned up and extended. 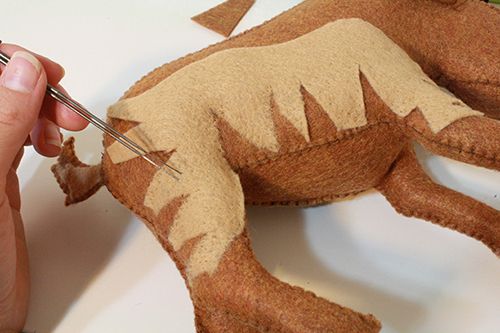 Faux fur is great, but it has obvious edges when cut, which showed pretty badly in some places. Plus it needed to extend further onto the face, like sideburns, and down around the neck and chin areas. So a spent a while cutting bits of fur off its mesh backing and needle felting it over the rough edges, into the sparse patches, and further onto the face and chin. Below you can see one side of the face with the mane extended, and the other side of the face still bare. 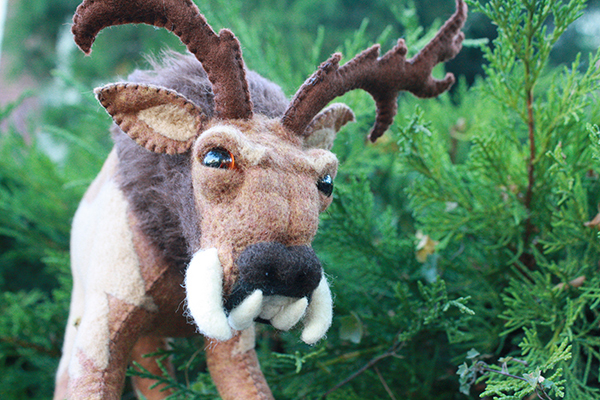 The antlers were sewn separately and stitched to the head, then some more of the body-brown material was felted on around their base to hold them more securely and make them look more like natural growths. And with that, Garruk’s Companion was ready to go tromping about the forest, scaring all the lesser creatures! Bring it on, pal! Can’t out-snarl me! Wonderful! What a work and imagination behind! He turned out wonderfully! Amazing job, your attention to detail is fantastic! Thanks for explaining your steps too! This is amazing! Gorgeous, inspirational, so cute! Wow! I’m not saying this because you’re just plain awesome, I’m saying this because it’s true: Your crafts get better and better with every post!